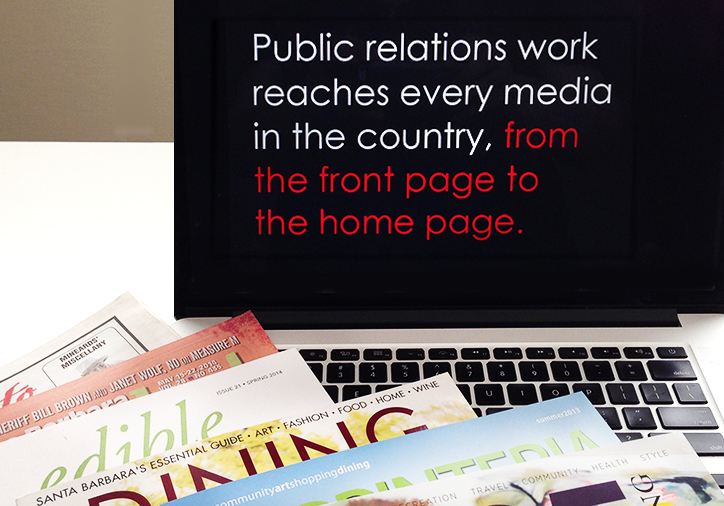 As PR experts, the goddard company public relations & marketing secures articles and interviews around the world, landing our clients on the front page and the home page. The Goddard Company, a full-service public relations agency founded more than 20 years ago by Jennifer Goddard Combs, creates and implements successful public relations campaigns for a diverse roster of clients in Ventura, Santa Barbara, the US and abroad. We secure publicity in newspapers, magazines, radio, television, and on the Internet; coordinate reprints and mailings; schedule speaking engagements; and invite and serve as the point of contact for the press at your special events. We offer a complimentary, one-hour consultation to discover what you'd like to achieve. We follow up, at no charge, with an outline of our suggested approach. Please call 805-565-3990 or email Jennifer. Did you know The Goddard Company generates international publicity? Check out our latest International page to see the work we've secured around the world. For the past 20 years, Jennifer Goddard Combs has created and managed successful publicity campaigns for her clients in Santa Barbara, Ventura, regionally, nationally, and internationally. Her integrity and creativity has allowed her to maintain good rapport with members of the media and produce excellent results for her clients. Stephanie Soldo has joined The Goddard Company Public Relations & Marketing as an account executive with an emphasis in media support. Soldo brings a strong passion for writing and client relations to The Goddard Company. After graduating from the University of Colorado with a degree in Structural Civil Engineering, she worked as an associate engineer for four years at a local Santa Barbara firm as she prepared for her dream career. Soldo is now writing her first novel and is looking forward to bringing her honed editorial skills to The Goddard Company. Amy Bentley has been a professional journalist for 30 years. With a background in public relations, marketing and journalism, Amy has written or edited hundreds of press releases, newsletters, e-newsletters, blogs, brochures, articles and other materials for a wide range of print and online media, businesses, government agencies and non-profits. Amy’s background in journalism is extensive. She worked for two years as the Copy Editor for Quilter’s Home, a national magazine, and was Managing Editor for Southern California Home & Outdoor magazine. She is a former reporter for the Ventura County Star and her freelanced articles have appeared in publications throughout Southern California, including the Orange County Register, the Ventura County Star, The Current (UCSB's online news publication), the Riverside Press-Enterprise, the Los Angeles Daily Journal and Riverside Magazine. Amy earned a Master’s Degree in Journalism from Northwestern University and a Bachelor of Arts Degree in Communication Studies from UCSB. Julie Price brings to The Goddard Company more than three decades of experience as a Southern California newspaper journalist and a corporate communications specialist. For most of her professional life, Julie worked for the Los Angeles Daily News, primarily as a news reporter, and for the Ventura County Star, where she spent 12 years as an award-winning features editor. Her other newsroom positions have included lifestyle columnist, news copy editor and wire editor. After leaving newspapers, Julie spent seven years in corporate public relations and internal communications, for CKE Restaurants and The Cheesecake Factory, respectively, before leaving corporate employment in 2017 and joining the Goddard team. Julie began her journalism career, as a staff writer for the Daily News, at age 19, while still in college.